Maurice Ravel composed Le Tombeau de Couperin between 1914 and 1917. He later arranged the solo piano suite for orchestra, omitting the fugue and the last movement. During the early part of World War I, Ravel was at work on a French suite for piano. Ravel was a truck and ambulance driver during World War I, serving under dangerous conditions at the front. After he suffered severe illness and surgery, Ravel returned to his suite in 1917. He dedicated each of the movements to friends that were killed in World War I. This Fugue was dedicated to the memory of Jean Cruppi. Ravel had previously dedicated his opera, The Spanish Hour, to Cruppi’s mother. 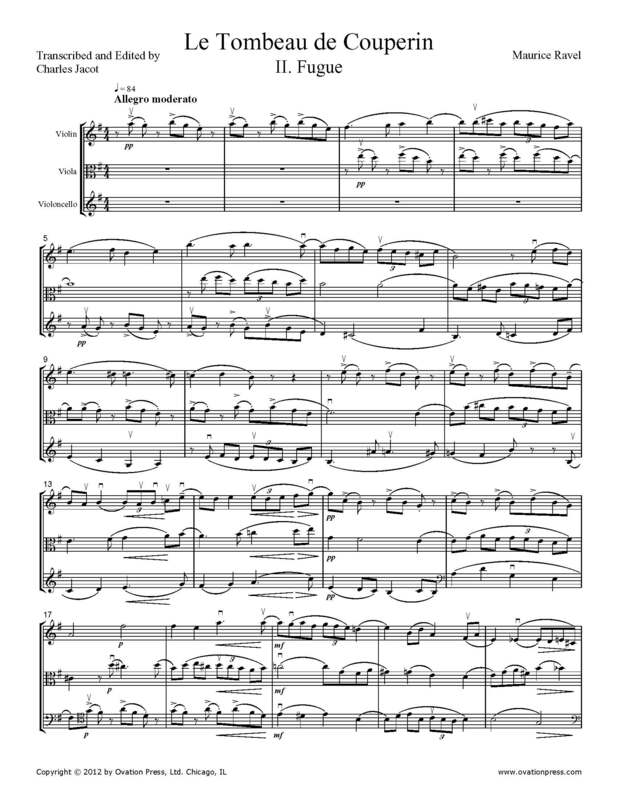 The Fugue has been a favorite of mine for many years, and I’ve often thought it would make a good arrangement, perhaps for woodwinds within the orchestral suite. While playing string trios in the past couple of years, the idea finally occurred to me to arrange the piece for that ensemble. It is a lovely, delicate, and heartfelt piece, with a mood of poignancy and bittersweet memory. Ravel weaves the simple subject with the winding countersubject material in a masterly way and combines these themes with their inversions as the piece develops. I left the piece in its original key of A minor, even though this causes a few problems; some notes that are too low for the violin were given to the cello, via double stops. Ravel’s original version, on piano, has a cool, abstract clarity to it. This setting brings in the ability to crescendo throughout notes as well as adding the warmth and vibrancy of string sound to the work.